Cambridge, MA—It’s a classic joke from the days of prank calls: Is your refrigerator running? Yes. Well, you better go catch it. Click. In reality, everyone wants their refrigerator—like all of their home appliances—to be running, and to do so smoothly and quietly. 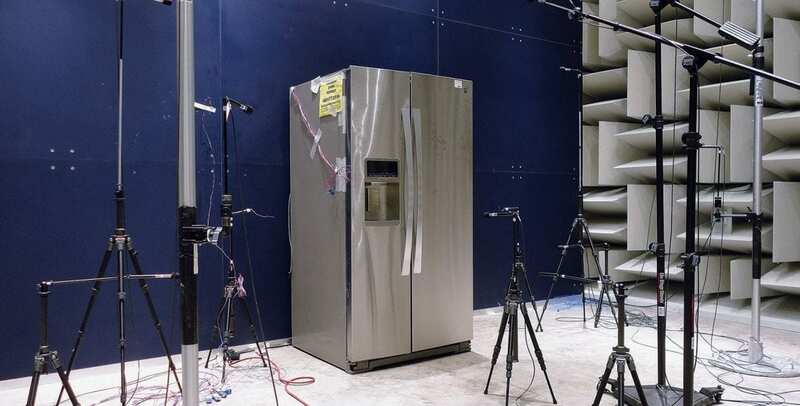 That’s why sound and vibration testing is key to Whirlpool Corporation’s product development. As the number one major appliance manufacturer in the world, Whirlpool prides itself on creating products that offer the utmost in quality and convenience combined with design that blends into the home. This means investing time and energy analyzing and minimizing the noise and vibration levels its products emit, testing both overall and component-specific levels, and adjusting designs accordingly. 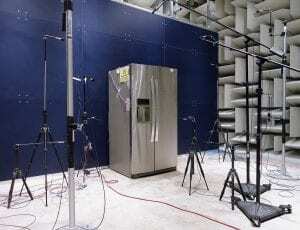 As part of a massive ongoing construction and refurbishment project (scheduled for completion in 2016) in Benton Harbor, Michigan—home to Whirlpool’s Global Headquarters—the manufacturer sought to upgrade its sound and vibration test capabilities with two new anechoic chambers designed for evaluating any product. To that end, Whirlpool contracted with ACS, a construction, design and engineering firm based out of Madison, Wisconsin. ACS functioned as the general contractor and, together with Whirlpool, selected Eckel Industries of Cambridge, Massachusetts, to supply the chambers. Eckel collaborated closely with Randy Rozema, Director of Technology Implementation for ACS, to design and install the chambers to meet Whirlpool’s needs and fulfill industry standards. The chambers—in the heart of the manufacturer’s new Benton Harbor Technology Center—required customization to offset external vibrations generated by a nearby railroad track and to accommodate special lighting requirements. The chambers are large enough to accommodate any Whirlpool product—from refrigerators and dishwashers to clothes dryers and stoves. One has dryer venting, a natural gas inlet, hot and cold water, and an isolated drain. The other has cold water and a drain. Each chamber also features a reflective plane to provide a surface similar to a kitchen wall. This wall is easily disassembled to transform the space from a semi-anechoic chamber into a hemi-anechoic chamber for component testing. 5 ft., 4 in. by 8 ft., 8 in. combination sound and wedge door, and spring-isolated concrete floors. The walls, ceilings and doors are covered with Eckel’s anechoic perforated metal wedges. 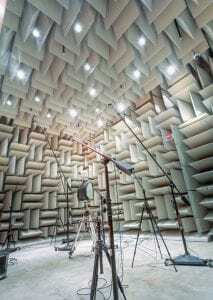 To allow for discrimination of very low level radiated sounds, the rooms have a 100 Hertz cutoff frequency and a maximum background noise level of 10 dBA (about the level of normal breathing). The chambers meet IEC 60704 test standards and ISO 3745 Annex A qualifications. According to Ingham, the chambers have functioned well even during ongoing construction in the building.